This is the highest quality Polymer magazine you can find for the AK-47 in 7.62x39, period. There is nothing that even comes close for the money or with the performance. 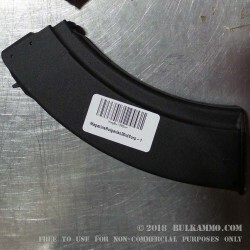 An all polymer magazine proven to function in the most adverse of conditions by both professional soldiers in Bulgaria, and by countless American shooters who swear by them. The feeding, reliability and robust build quality means you get a bargain for a lifetime magazine. The clean outer appearance of a jet black, finely textured polymer gives a stealthy, subdued appearance that fits with blacked out AK’s. The highest quality spring and follower guarantee perfect reliability in any conditions and the thick polymer magazine body is flexible, but not overly flexible, meaning you won’t have inadvertent mag releases or feeding concerns, due to lack of proper feed tension. Easy to clean with heavy duty bottom plate and sure locking capability on the lug gives you long-term heavy duty use potential. Bulgarian magazines have incredible reviews and enjoy an excellent reputation because they are workhorse magazines with quality features and a general build quality that is superior to any other plastic magazine, but also which outperforms steel and bakelite magazines in many aspects, including light weight.